On 26 October 2018, Amendment VC154 came into effect to enable the planning system to better manage water, stormwater and drainage in urban development. Amendment VC154 amends Clause 19.03-3S (Integrated water management) by implementing an objective and strategies for integrated water management and incorporating the objectives and strategies of the deleted Clause 14.02-3S (Water). The revised Planning Policy Framework (PPF) will better support coordinated action at state, regional and municipal levels on integrated water management. 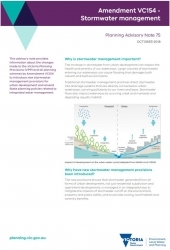 Stormwater management mechanisms will also be strengthened by applying consistent requirements to the development of two or more dwellings, commercial and industrial development, public use development and all subdivisions in urban areas and address gaps in the planning framework for stormwater management. Revisions to the PPF will streamline policies related to integrated water management by reducing a range of overlapping but separate policy sections of the PPF. A consistent approach to planning requirements for integrated water management will assist both responsible authorities and applicants to navigate the planning framework more effectively. Planning Advisory Note 75 provides information about the changes made to the Victoria Planning Provisions and all planning schemes by Amendment VC154 to introduce new stormwater management provisions for urban development and amend State planning policies related to integrated water management. The Department of Environment, Land, Water and Planning (DELWP) will be providing training sessions in Melbourne and regional Victoria to support practitioners and provide further information and guidance about the changes introduced by Amendment VC154 for industrial, commercial and multi-dwelling developments. Sessions will be held in Traralgon (19 November), Ballarat (23 November), Bendigo (30 November) and Melbourne (21 November & 7 December BOOKED OUT, additional sessions have just been opened for 10 & 11 December).